Jack Wisby was born in London, England on June 7, 1869. Wisby arrived in San Francisco in 1892 with his fiancée Mary Anne Fossey. For a few years he was an engraver at Shreve’s and began painting without benefit of formal art training. At the turn of the century he made many sketching trips to Yosemite and Lake Tahoe. After his studio and many of his early works were lost in the 1906 disaster, he moved across the Golden Gate to Marin County. He lived in Inverness until 1912 when he built a studio in nearby Bolinas. 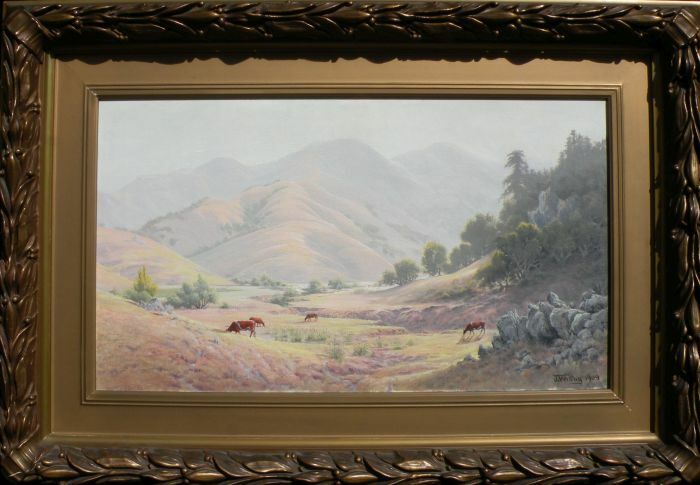 During this period he painted many scenes of Lucas Valley and the San Geranimo hills. Never having to depend on commercial art for income, he made a good living from his paintings. In 1919 he made his final move to a home at 12 Harcourt Street in San Rafael where he lived until his death on January 3, 1940. Wisby is best known for his soft, poetic oils of northern California which often have water reflection. Using small brushstrokes, his style evinces his training as an engraver with great attention given to minute detail. Exhibited: Berkeley Art Association, 1906; Torrance Gallery (San Anselmo), 1960 (retrospective). Works held: San Mateo County Historical Museum.